GK AppSite - March pattern in bright colors from the world renowned design studio GavickPro. 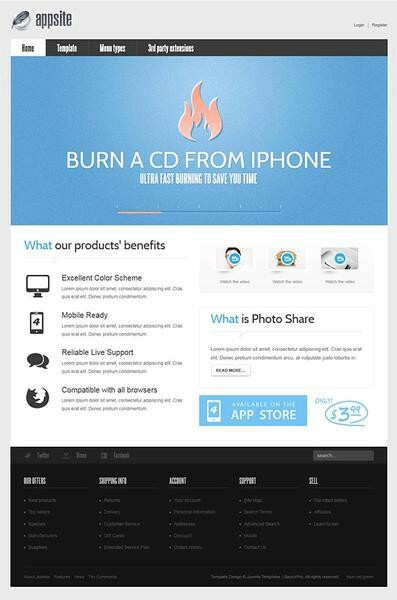 Contemporary design template is perfect for creating a company's website. Developers have tried to release the template pattern, which meets all the requirements of a quality website. Using the new web - HTML5 markup technologies and CSS3 animations give a special unique pattern and sophisticated appearance. Studio extensions that are included in the assembly, can provide all the information to site users in a flexible and intuitive way. In addition, responsive design template will properly display pattern on any tablet and mobile platforms.